Rajasthan literally means the ‘Land of Kings’ or ‘Land of Kingdoms’ as a number of dynasties and mighty warriors ruled this vast landmass that was once divided into royal feudatories. The northern state is India's largest occupying an area of 3.42 lakh sq. km or 10.4% of the country's total land mass. 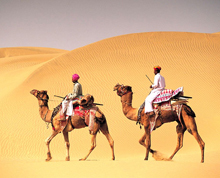 Comprising the vast and inhospitable Thar desert (Great Indian Desert), Rajasthan shares border with Pakistan provinces of Punjab to the northwest and Sindh to the west. The Sutlej-Indus river valley is shared between Rajasthan and Pakistan's border provinces. Punjab to the north, Haryana and UP in the north-east, MP to the south-east; and Gujarat to the south-west surround Rajasthan which is known all over the world for its colourful festivals and organised melas (exhibitions). Keoladeo National Park near Bharatpur (east Rajasthan), a World Heritage Site, is known for its bird life. Rajasthan is also world famous for its two tiger reserves -- the RanthamboreNational Park in Sawai Madhopur and Sariska Tiger Reserve in Alwar. The state was formed on 30 March 1949 when Rajputana – the name adopted by the British Raj for its feudatories in the region – was merged into the dominion of India. The state capital and largest city is Jaipur located on the state's eastern side. Rajasthan is a popular state for its cultural extravaganza, rich costumes, exciting festivals, beautiful palaces, forts and mouth-watering cuisines. The people of Rajasthan belong to different castes and tribes. In the zones in and around Jaipur, Alwar, Bharatpur and Dholpur in the southwest of the state, locals belong mostly to the trading communities of the Minas, Meos, Banjaras and Gadia Lohars. These people are good craftsmen (artisans) and they travel widely to sell their exquisite produce. The Bhils, famed archers and one of the oldest tribes of India, inhabit the districts of Bhilwara, Chittaurgarh, Dungarpur, Banswarara, Udaipur and Sirohi. The Grasias and nomadic Kathodis live in the Mewar region. The Sahariyas are found in the Kota district, and the Rabaris of the Marwar region are nomadic cattle breeders. The important communities of Rajasthan are the Rajputs, Jats, Brahmins and the traders. The Rajputs are the martial race, known for their chivalry and valour. The Brahmins are the priests and teachers while the Mahajans are still the backbone of the village economy. The Jats and the Gujars are the agricultural communities. The people have an amazing zest for life and are as fun loving as industrious. They have a rich tradition of folk music and dance. Each region has its own dance styles, songs and music. Several communities of professional performers - the Bhaats, Dholis, Mirasis, Nats, Bhopas and Bhands, spend their lives going from village to village. The villagers patronise them and even participate in their performances. The state is divided into 9 regions; Ajmer, Hadoti, Dhundhar, Gorwar, Shekhawati, Mewar, Marwar, Vagad and Mewat which are rich in their heritage and artistic contribution. For political and administrative reasons, Rajasthan is divided into 33 districts which had further eased the process of micro-governance reaching out to various communities. These regions have a parallel history which goes along with that of the state. The early history of Rajasthan includes some of the great maharanas, nawabs and fiery warriors. Prominent among them were Prithiviraj Chouhan, Samrat Hem Chandra Vikramaditya (also known as Hemu), Mughal Emperor Akbar, Maharana Udai Singh, Maharana Pratap, Raja Maan Singh and others. Rajasthan’s formerly independent kingdoms have developed a rich architectural and cultural heritage. Some of the historical legacy of royal dynasties can be seen today in numerous forts, palaces,monuments and heritage sites that dot Rajasthan. The culture of Rajasthan is a grand fusion of Rajput, Muslim and Jain lifestyles who lived in perfect harmony in the past. Rajasthani is a language of the Indo-Aryan lingua franca family. It is spoken by 20 million people in Rajasthan and neighbouring states of India and Pakistan. Along with Marwari dialect, over 73.53 million people in Rajasthan speak native language. 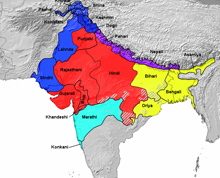 Marwari is one of the languages descended from old western Rajasthani or Maru-Gujar or Maruwani. 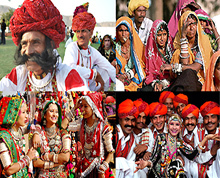 Most of the Rajasthani dialects are chiefly spoken in the state of Rajasthan. Hindi is the official and the most widely spoken language in the state (91% of the population as per the 2001 census), followed by Bhili (5%), Punjabi (2%), and Urdu (1%). Rajasthan has a population of 7.3 crore people consisting of Hindus (88.45%), Muslims (9.08%), Sikhs (1.27%) and Jains (1%). A sizeable number of Sindhis who had migrated from Pakistan after partition have made Rajasthan their home. The diverse mix of communities, clans, sects and tribes make Rajasthan a melting pot of pluralistic traditions with unhindered social peace among people ofdifferent faiths.